It is now in the last week of July, and these plants within 65 km of Vancouver have been growing quite fast. I write posts regularly almost each week. Since plant growth in summer can be well over an inch a day on some plants, the garden changes are quite noticeable each week. 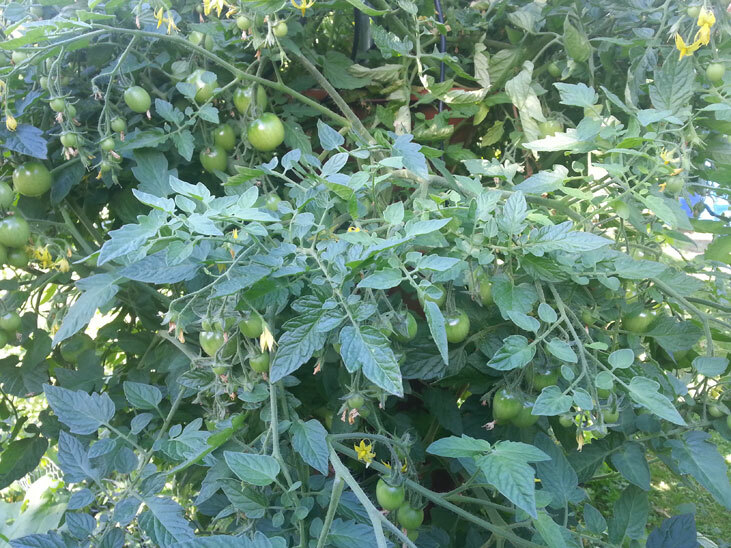 In addition to size changes, everything is going deeper into the fruiting cycle and this is the first week where a few tomatoes are showing the ripening orange/red coloring. Looking back just a week or two ago, it seemed like a single daily feeding would do. But not anymore. On cloudy or rainy days, a single or double feed might do, but, in full, hot sun two to three feedings/waterings are required. 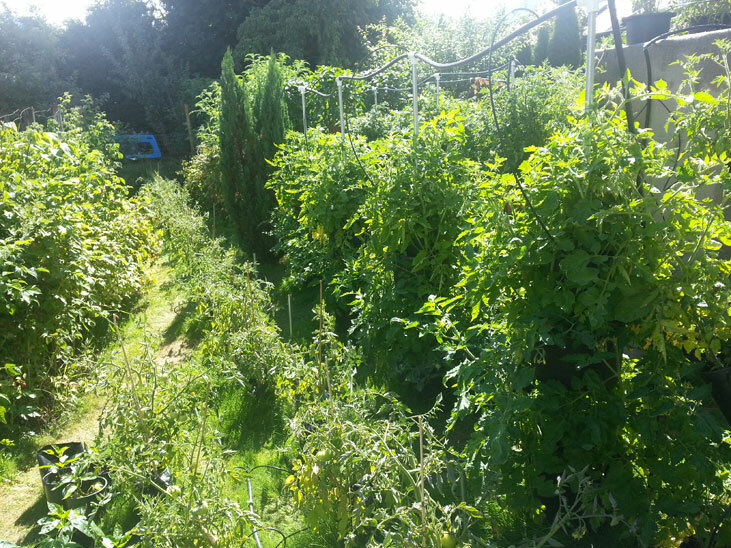 In general, the tomatoes are the big feeders and have quite the thirst. Peppers and lettuce could easily go with a feed every day or two; depending on size. When I do a plant count count and estimate production, it looks like this ~250 square foot vertical garden will produce more than we can eat in one year which was the original goal. The estimates are based on eating one bell pepper per person per day and 4 tomatoes per person per day. By making sun dried tomatoes, tomato chips, lettuce chips it may be doable. 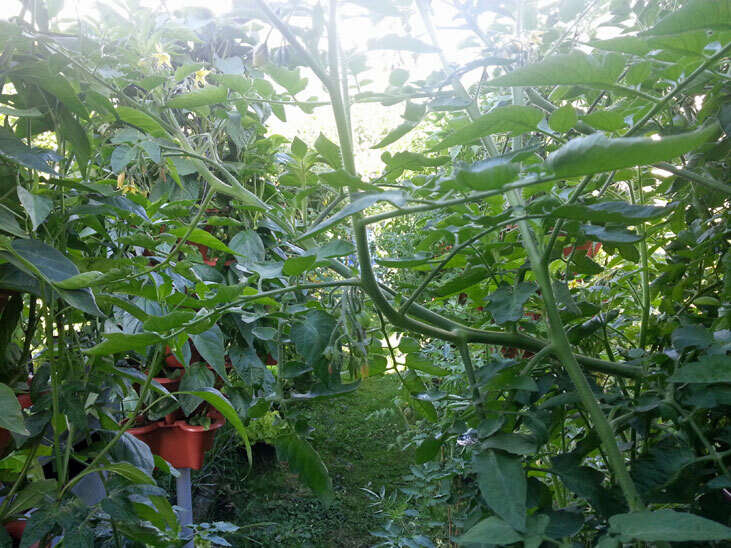 Some tomato tiers are already stretching over 8 feet tall from top to bottom. 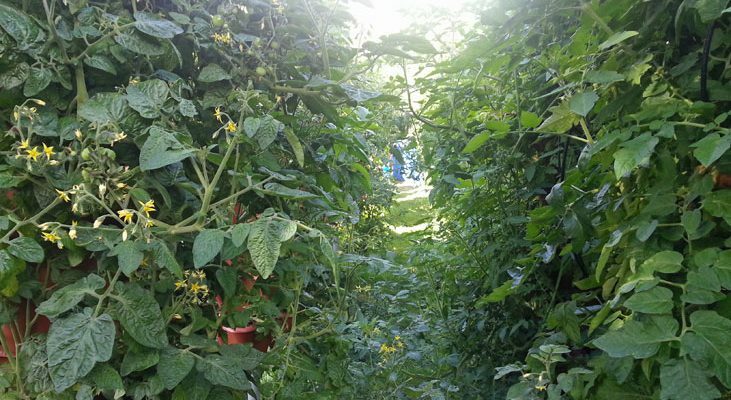 There are several tomatoes per column, for which all are determinate, non-staking, bush-like and do not grow continuously. If the plants were indeterminate, size could even be larger. 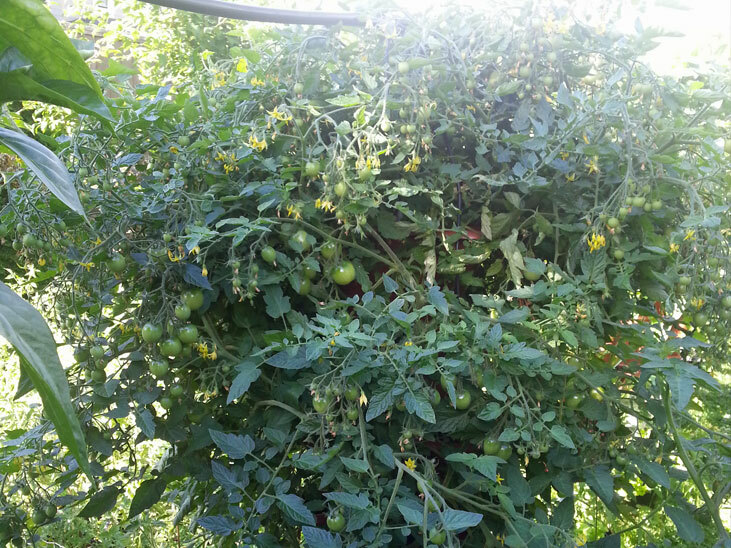 Overall, the hydroponic tomatoes in vertical columns are doing best. Some are grown in small 1 gallon grow bags and will produce okay too. 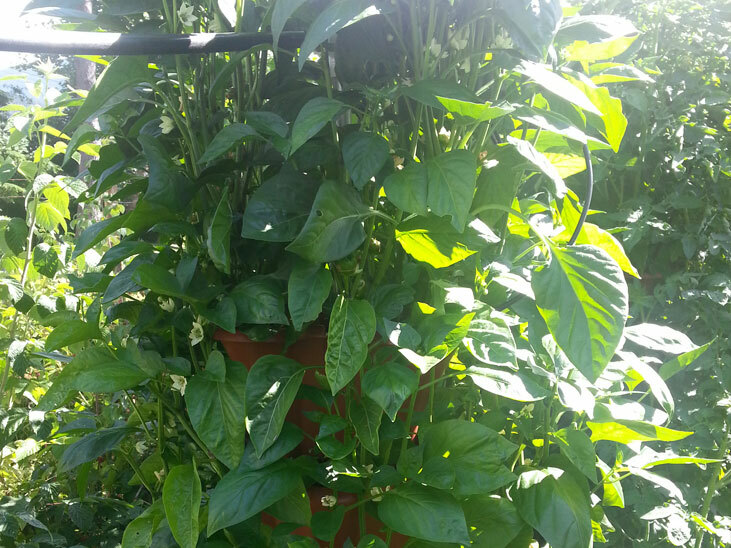 Several plants in vertical planter. Romas stacked in 3 buckets high. 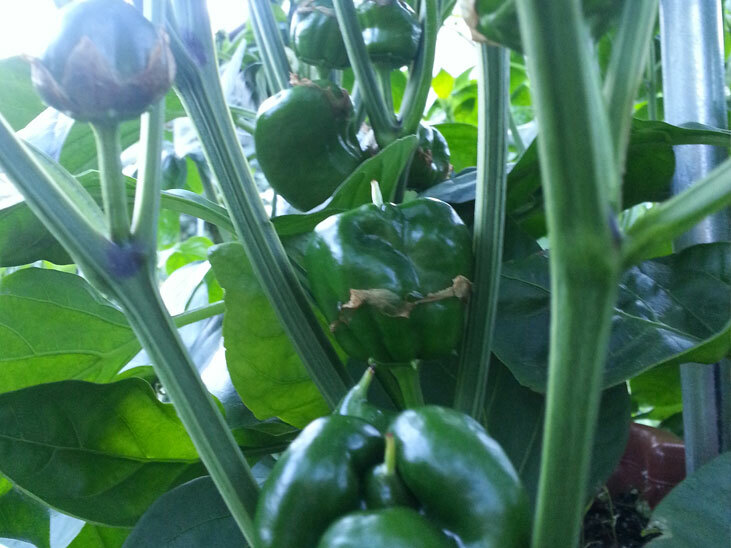 Peppers are really starting to set fruit. They will be fine eaten fresh or dehydrated and be used for soups and sauces. 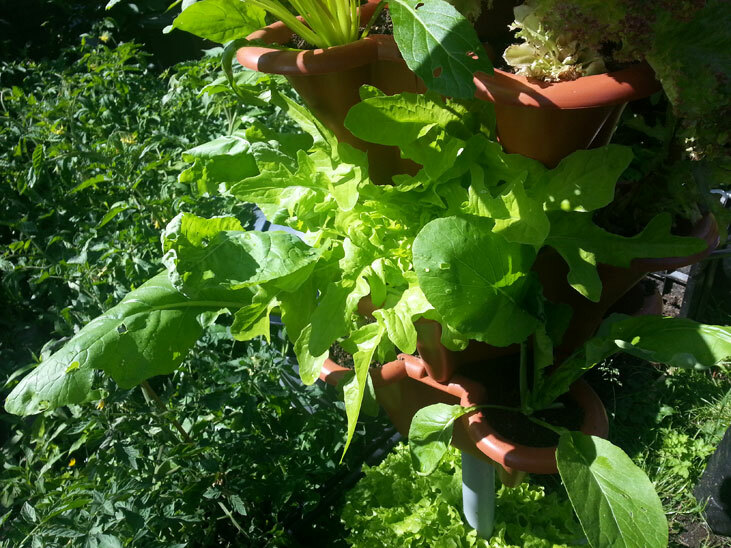 This year, there has been over 15 varieties of lettuce grown in the tiers. Although the various looks and colors can be neat in its own way, there are many unpredictable factors for using some mixed lettuce; such as small plants bolting very quickly and it is like roulette because some plants simply taste horrible while others replicate Spinach and Kale. On the other hand, one of the perks of some mixed lettuce seed is to experiment with new flavors of lettuce. 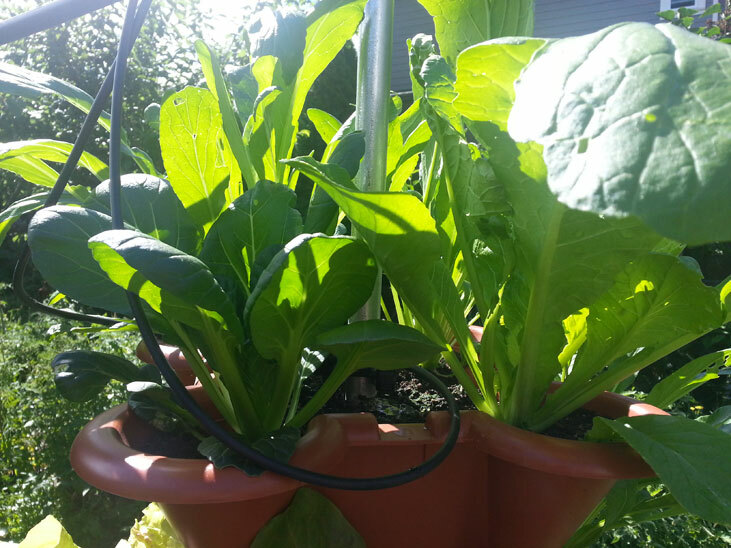 After using so many packets of seed, I recently just bought a good number of Grand Rapids Leaf lettuce which taste great, most of which grow 4.5 months without bolting, is not a desirable choice for bugs, slugs and snails, grows quickly, and always looks good. They will be grown in a greenhouse starting in the fall.